A 2017 study by the Better Sleep Council found that a majority of respondents ranked sleep as their #1 health priority, and that 85% agreed with the statement, “a good mattress is key for getting a good night’s sleep.” If you’re reading this, you probably agree on the importance of a quality mattress, and want to know where to buy a mattress in Indianapolis. Fortunately, the city has an abundance of options. There are a total of 64 mattress stores in Indianapolis- much higher than usual for a city of its size. In fact, that works out to one mattress store every 5.7 square miles. Some of these have a wide selection, some sell closeouts at steep discounts, and some stores stock specialty mattresses like organic, gel and foam models. A great number of mattress stores carry both furniture and mattresses. Which is right for you? If you’re wondering where to buy a mattress in Indianapolis, read on. 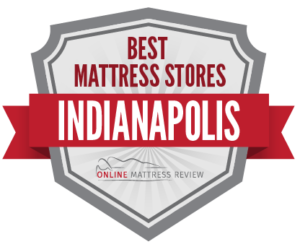 We’ve combed the reviews for mattress shops of every type and presented the best of the best in each area of Indianapolis. In the heart of Indianapolis, you’ll find a large number of commercial buildings, restaurants, boutiques and bars, all packed together in a bustling downtown. What you won’t see a lot of is mattress shops, which tend to take up quite a bit of space for both floor models and inventory. There are, however, a few places to buy a mattress in Indianapolis in the downtown area. One of these is AFC Mattress (1542 S East St), in the Bates Hendricks Neighborhood. This family-owned shop offers wholesale prices on both furniture and mattress. Further to the south, just past Garfield Park, another option is Hoosier Overstock Mattress (3000 Shelby St). Hoosier sells overstock and budget brands of spring, foam and memory foam mattresses, along with furniture for the whole house. The inventory and prices at this store change frequently, so customers should check the website for the latest stock and offers. For cramped apartment dwellers, The Bedder Way Co. (3450 Developers Rd) is worth a look. The store sells surprisingly attractive and comfortable Murphy beds and Sealy mattresses to fit. Customers love the functionality, appearance and feel of these hand-crafted, wooden wall beds. American Mattress, a locally-owned and –operated mattress store in Indianapolis, has locations in the Warren (9369 E Washington St) and Pickwick Commons (1410 W 86th St) neighborhoods. Customers here consistently report outstanding service from sales associates, who are courteous, knowledgeable, and patient, and work with each customer’s budget, comfort preferences and individual sleep issues to find the right product. Budget shoppers in North Indiana can head to Mark’s Mattress Outlet, Willow Lake (2424 Lake Cir Dr) or Gordon’s Discount Mattresses and More (7625 N Michigan Rd), both of which sell highly affordable mattresses and furniture. In a no-frills, warehouse-style setting. Customers in search of eco-friendly and natural mattresses and bedding products can find a selection of healthy, green products at The Clean Bedroom (1760 E 86th St). This alternative mattress store store stocks top natural brands like Royal-Pedic, Oyasumi, and Obasan, made from materials like organic cotton, natural Dunlop, Talalay latex, and organic wool. A surprising number of mattress shops are clustered around a stretch of US-31 in south Indianapolis that might well be called “Mattress Mile.” Here, you can find Today’s Furniture and Mattress (8010 US-31), Mattress Firm Indianapolis South (7701 S US Hwy 3), Mattress Firm Clearance (795 US-31), Bob’s Discount Furniture (7565 US Highway 31 South), American Mattress Indianapolis South (1551 E Stop 12 Rd), The Room Place (7609 Shelby St), Sleep Number (8707 US 31 South), Long’s Mattress (1280 US Highway 31 N), American Mattress Superstore (733 Loews Blvd), Bedding Liquidators Sleep Shop (8811 Hardegan St), and The Mattress Guys (647 US-31). If you’re wondering where to buy a mattress in Indianapolis, there’s no question that this mattress mecca is the place to start, and customers who can take the time to visit multiple stores in this area should be able to score a real bargain. Of the many mattress shops in this district, Yelp reviewers give the most stars to American Mattress Indianapolis South, a locally owned company. Multiple five-star reviews cite knowledgeable and friendly staff, and the store stocks top name brands like Serta, Tempur-Pedic, and Beautyrest. Shoppers looking to buy a mattress in Indianapolis in the East of the city should be sure to visit BMV Mattress Indianapolis (8118-20 E Washington St). BMC Mattress is the single biggest top-brand mattress liquidator in the country, and an excellent resource for customers who want to purchase a luxury mattress at the price of a standard model. BMC Mattress stocks discontinued models, closeouts and overstocks from brands like Posturepedic, Optimum and Stearns & Foster. Customers rave about bargains they’ve scored, at discounts of up to 60% off retail. One of the other best-reviewed mattress shops in the eastern area of Indianapolis is American Mattress Indianapolis East (4909 E 82nd St), located in the Clearwater Springs Shopping Center. Customers give this store top reviews for well informed and patient sales associates, who are willing to take the time to walk prospective buyers through their options, and who go the extra mile to make sure their mattress delivery is fast and seamless. Up in the West Indianapolis neighborhood of Royalton, shoppers on a budget can score a deal at Best Value Mattress Warehouse (5727 W 85th St). Don’t expect a fancy showroom or sleep consultation here- Mattress Warehouse maintains a simple retail space that’s well-stocked with name-brand mattresses at deep discounts, especially high-end products. Reviewers report that the owner provides knowledgeable and laid-back customer assistance, and works within each shopper’s budget. The store promises discounts of 50-80% off retail, and even throws in a free pillow with every mattress purchase. Less than a block away, bargain hunters can also explore the deals at Mattress Firm Clearance (5630 W 86th St). Mattress Firm is the nation’s top mattress retail chain, and the store sells all the top name brands in foam, spring, hybrid and adjustable beds. The clearance center is well-stocked with affordable mattresses that have had previous lives as floor models, or which were returned by other customers before the store’s 100-day free-return window. A bit further south, American Freight Furniture and Mattress (5615 38th St) gets great reviews for reasonable prices on name-brand, affordable mattresses and furniture, along with helpful sales staff and fast delivery. This national liquidator offers deep discounts on memory foam, pillow top and euro top mattresses, and stocks reliable brands like Simmons Upholstery, NordicRest and Stewart & Hamilton.